A number of factors can affect the physical and chemical properties of compounds. One important factor is the electronegativity of atoms inside a molecule. Electronegativity is a measure of the tendency of an atom to attract bonding electrons toward itself. This property of atom affects the bond polarity and, in turn, how molecules will interact with other molecules. In this article, electronegativity and its effect on compounds will be discussed. Electronegativity is defined as the tendency of an element or atom to attract bonding electrons towards itself. It also tells one the property of an atom to withdraw electron density when a covalent bond is formed. It is one of the periodic properties of the elements. This means that the elements are arranged in the periodic table in such a way that they show a certain trend in their chemical and physical properties. Electronegativity is a function of an atom’s electron affinity and ionization energy. These two properties tell us of how strongly an atom holds its own electrons and how they attract other electrons, respectively. The general trend of electronegativity is that it increases from left to right (metals to non-metals) along a period. For the s and p block elements, the electronegativity increases as you go up a group. The most electronegative element in the periodic table is Fluorine. Going across the periodic table the affinity for bonding electrons increases because nuclear charge increases without a significant change in the distance of the valence electrons from the nucleus. One important property of molecules that is dependent on electronegativity is bond polarity. When two atoms form a covalent bond, the electronegativity values of the atoms involved in forming the bond dictate the polarity of the bond formed. Bonds formed can be polar or non-polar. Polar bonds are formed when two atoms of different electronegativity values combine. For example, the compound hydrogen fluoride, HF, is a polar compound because the bond between the H and F atoms is a polar bond. The H atom has an electronegativity value of 2.2 while a F atom has an electronegativity of 4.0. In the molecules of HF, since the F atom has a higher electronegativity value than H, it has a higher tendency to attract the electron density of the bond towards itself causing it to be slightly negative. H on the other hand, because of the pull of electrons of F, becomes less negative or slightly positive. The same goes for water molecules. Water contains two OH bonds. Oxygen is a more electronegative element than hydrogen. Therefore, the covalent bond between these two atoms is polar with the O atom being the negative end and the H atom as the positive end. A different scenario occurs in the compound O2. The molecule only contains two oxygen atoms connected by a covalent bond. Since, the two O atoms have the same electronegativity value; the two atoms will have equal strength in pulling electron densities towards it. Because of this, there will be no apparent poles in the compound, and the compound is considered to be non-polar. Bond polarity affects how a compound will interact with other compounds. In terms of solubility, polar compounds can dissolve in other polar compounds. On the other hand, non-polar substances can dissolve in other non-polar substances. For polar compounds, dissolution is made possible by the electrostatic interaction between the positive and negative ends of molecules. The electropositive end of one molecule readily attracts the electronegative end of another molecule. For example, considering the molecule of water, the polarity arises with the O atoms being at the negative end while the H atoms are at the positive ends. 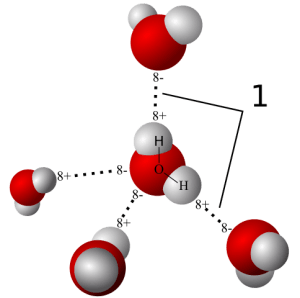 When two water molecules interact, the H atoms of one molecule are attracted to the O atom of the other molecule. The apparent bond formed is a special type of bond known as a Hydrogen bond. Resonance is the occurrence of multiple Lewis structures for a given molecule brought about by the movement of electrons among atoms in a compound. The movement of electrons is dictated by the electronegativity value of the atoms involved in the Lewis structure. Resonance involves rearrangement of pi and sigma bonds within a molecule. This means, the molecule is technically unchanged. The same atoms are connected together, the main difference is just the arrangement of single, double and triple bonds. The molecular formulas, as well as the total number of electrons and over-all charge, will still be the same. For example, the deprotonated form of acetic acid will exhibit resonance. Initially, the negative charge is localized in one of the oxygen atoms. But because of the innate electronegative property of the other oxygen atoms, it has a tendency to attract the localized charge towards itself. This is made possible by the rearrangement of the pi bonds. 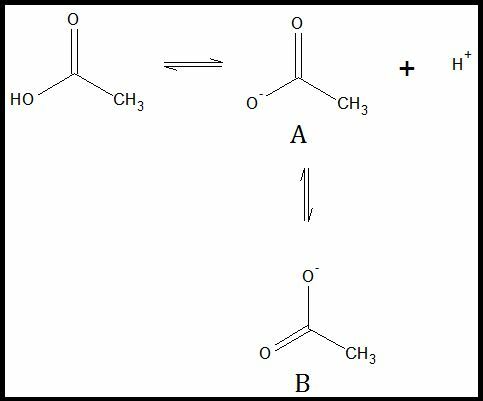 Structures A and B are resonance structures of each other. They have the same molecular formulae but have different arrangements of pi and sigma bonds. The rearrangement follows the mechanism in the figure below. The effect of resonance is important in different compounds as it increases the stability of compounds towards electrophilic or nucleophilic interaction. For example, since the negative charge in the acetate anion is “transferred” from one oxygen atom to another, the ion becomes less able to donate its extra electrons or the negative charge in a reaction. The delocalization of the negative charge reduces the reactivity of the molecule. Another form of delocalization of charges is through induction or inductive effect. Inductive effect is the electronic effect of an atom or a group of atoms to adjacent bonds in a molecule. Groups that cause inductive effects are usually remote (not adjacent) to the reactive side. Unlike in resonance where actual delocalization of charges occurs, in inductive effect there is only apparent delocalization because of the pull of electron density by the electron-withdrawing group. For example, consider the compound chloroacetic acid. The only difference between chloroacetic acid and acetic acid is the replacement of one alkyl hydrogen by a chlorine group. Since a chlorine atom is more electronegative than a hydrogen atom, chlorine has a higher tendency to attract electrons towards itself. The chlorine atom tends to pull the electron density of the C–Cl bond leaving the C1 atom as slightly “positive.” The C1 atom then has a tendency to pull the electron density from C2, then C2The more electron-withdrawing group (electronegative groups) causing inductive effect, the more stable the acetate molecule becomes. For example, replacing another H atom with a Cl atom in the chloroacetate ion, increases the stability of the compound due to stronger delocalization. Sometimes both resonance and inductive effects are present in the same molecule. Some functional groups can have one type of inductive effect and the opposite resonance effect. 1. Which of the following pairs of compounds will form the most polar bond? 2. Which of the following is the least reactive compound? Burdge, Julia & Overby Jason (2012). Chemistry Atoms First. USA: McGraw-Hill Companies, Inc.
Jack DeRuiter. (2005). Resonance and Induction Tutorial. Principle of Drug Action 1.